Injector Dynamics ID F750 Fuel Filter UNIVERSAL - Dezod Motorsports Inc - Home of the automotive performance enthusiast since 2002. Electronic fuel injectors are built to precise dimensions, measured in microns. The smallest of particles can increase wear, or even destroy a fuel injector. Bosch provides a specification for protection of electronic fuel injectors, which is a minimum capture efficiency of 87% at 5 microns, and 100% capture efficiency at 35 microns. This means that the filter will capture at least 87% of all particles 5 microns and larger, and 100% of all particles 35 micron and larger. The filter element in the ID F750 meets that specification, and does so without undue flow restriction. The ID F750 is designed to hold a high level of contaminant while maintaining low restriction to flow. This is accomplished with a highly efficient filter element, designed with low pressure drop in mind. 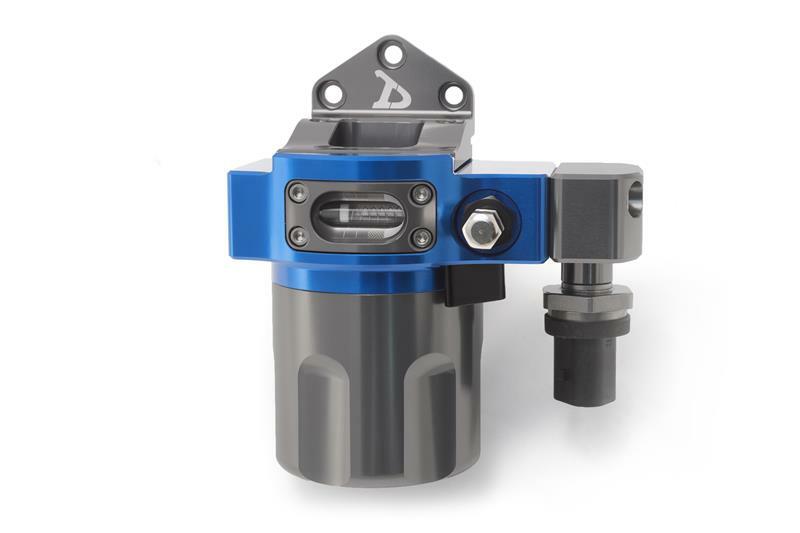 At a flow rate of 750 liters per hour, the ID F750 will hold five grams of contaminant, the equivalent of approximately one teaspoon before requiring replacement. Higher flow rates are possible, but will require more frequent filter changes, depending on the cleanliness of your fuel system. Delta P is short for delta pressure, which is the difference in pressure between two points. In this case, those two points are the inlet and outlet of the filter. The Delta P indicator gives a visual indication of the condition of the serviceable filter element, so that it can be replaced before it becomes a problem. The spin on filter housing features a safety latch to ensure that the housing can not spin off, should it loosen. It is easily released with one finger, and emits an audible click during assembly. The ID F750 includes a standard Schrader valve and an o-ring sealed spin on barb which actuates the needle. This valve can be used for pressure monitoring, draining the system, or relieving pressure for filter changes. The modular design allows for numerous mounting options, from the standard 90°, straight, and reverse 90°, to roll bar tube mount brackets, and everything in-between. Custom brackets can also be provided for application specific fitment. The plug and play pressure and temperature sensor features a Bosch Motorsport 10 bar (145 psi) pressure sensor, with integral -40 to 140°C (-40 to 284°F) temperature sensor. It installs with two screws, and adds 30 mm to the overall width. Due to its compact size, it can be added to most systems without need for re-plumbing. Design intent, detailed specifications, filter theory, installation instructions, servicing, etc. are all covered in detail in the comprehensive Technical Manual.